Got strange looks as we (strangers) walked in. But clean, and comfortable, and with 3 ales on, and (apparently - though untested) an all-day menu of food reasonably priced. Came in here on Thu afternoon and was very impressed. Two helpful members of staff behind the bar. Broadside at £3.14 and Old Hooky at £3.04. Lots of different areas to sit, the food being served looked good and the bar staff were more than accomodating when I asked for one of the televisions to be turned on so I could watch the IPL cricket. My experience was very good! Havn't been in this pub for quite a few years and how it has changed. Popped in for a couple of pints of Real stuff over the weekend and will not be doing it again. Real ale was in short supply and ended up with Ruddles, not a bad pint when kept well but this was not. Alternative was courage best or Broadside both of which did not appeal to me so ended up with lager. Originally started in the public bar but moved to the quiet bar, to escape the hostile and smelly atmospere. Finally, the seating arrangements in the pub are totally inadequate , especially the public bar where it is almost impossible to find a seat even when the pub is half empty. 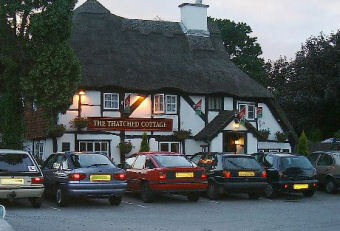 The Thatch, under Dean's management was a good place with *excellent* beers. He once told me I should venture in and try an ale. Upon hearing that I walk past the place because of smoking, he changed the fan filters and made one half of the pub smoke free. Good bloke ! Unfortunately, the successive management have made a right hash of the place. First Debbie, then Dianne and back to Debbie. Asked for a Black Sheep. Drinkable, but on 'the turn'. Mentioned this, but was ignored. Next customer ordered one with his meal, but brought it back to the bar; only to be told by the barman that he wasn't allowed to replace it and the customer would need to buy another ! That raised a few eyebrows, not to mention the customer's temper. I was about to mention items-fit-for-sale under trading law, but the customers voiced demand to see the manager did the trick. Yes, the beer had gone off, but wasn't removed from the chalk board. Next I asked for a Spitfire. Also on the point of going off. Informed them and was ignored again. Friend came in for a Best. He informed them there was another couple of pints left in the barrel [before it too goes 'off']. He was ignored. ...and don't get me started on how long it takes to get served. Three staff working, but none behind the bar. Where the hell are they ????? Manageress, sat with friends, could obviously see all this from were she was sat. The problem with this pub is that 95% of its customers (NOT punters!) prefer Fosters. At �2.45/pint compared to �3+ for ale this is not surprising. Of the staff employed, only one drinks ale and he doesn't sample the beers at the start of his shift. ??? Why not ??? Maybe I'll ask. If an ale needs changing, this is done *if* they have time. Usually at the end of the night; if a Fosters needs changing, this is done immediately. They allow a tab system to run so you don't need to keep paying for every order, but you have to keep a sharp eye on the final cost since they now have a [regular] habit of messing this up. Recently was asked to pay my tab of �15, for three beers! The printout showed I'd bought a Smirnoff Ice and some WKDs, so someone paid for my ale. Foul language, obnoxious body gases, sky high beer prices, incorrect bills and very poor service are becoming the norm in this establishment so I've been thinking it may well be time to return to the homebrew because the pub I'd really like to walk to is 45mins+ on foot. This is an lovey looking pub that has terrible attitude. If you can put up with the foul smells, foul language and alchopop teens and actually get a drink you may well find yourself being chastised for complaining about the poor service, poor beer and abusive language. There are much better pubs in the area and quite honestly why would you sponsor such a hostile environment. Whoever runs this pub please review your aggressive policy towards paying customers. Whoever thinks about visiting this pub please think again. A charming historic building full of not so charming people.